Areas with residential gardens that take up 30% or more of the total are 42% higher than the English average. So, does that mean you should give up valuable space to allow for more spacious gardens? It’s no secret that having outdoor space and kerb-appeal can make a real difference when selling a residential property. If the garden is spacious and south-facing, then even better. But new research has revealed a garden could have a bigger influence on property prices than first thought. According to recent research by online estate agents Emoov, areas with residential gardens that take up 30% or more of the total landscape have an average price of £343,344 – 42% higher than the average house price in England, which is £242,286. Whereas areas with 20% to 30% gardens average £303,545 – 25% higher than the national average – and locations with gardens that make up 10% or less have an average house price of £255,159 – 5% higher than the national average. These figures fit with recent claims that 37% of Brits are spending more time in their garden than 5 years ago and that gardens are becoming increasingly desirable to home buyers. Is There More to Adding Space? It’s not just the presence of a garden that can add value and make a property more desirable, but the features of such a space. 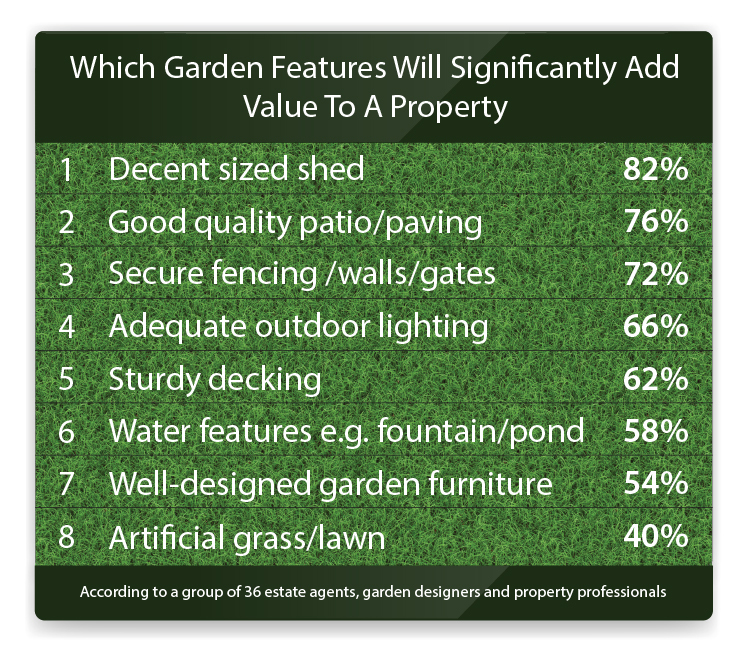 A survey by Sellhousefast.uk found the garden elements that will significantly add the most value to a property are a decent sized shed, good quality patio/paving, secure fencing/walls/gates, and adequate outdoor lighting. The UK government has recognised this and is now encouraging the development of new garden villages, towns and cities with huge investment opportunities. This new way of living combines the best of town and country, with affordable housing, facilities, jobs and plenty of outdoor space in a bid to battle the housing crisis. However, this could mean abandoning traditional money-making practises to maximise the number of properties built, and to choose bigger homes on more spacious plots instead. As stated above, in some instances, this could make great financial sense – especially if grants are available. However, we’d always recommend doing your research and to weigh up the benefits of the options available to you. Whether you’re looking to build a house and garden near a new garden city or an apartment block in the city, if you need property development funding, we can help. Get in touch with our team today to find out what finance deals are available to you.